Amidst all that work though, I learned a lot and gained quite a bit of inspiration from the process. The most interesting part to me was the planning phase. While most people you see on those DIY shows tell you to just choose a starting point and work out, using spacers to maintain the grout joints, my father-in-law explained how real tile layers don’t use spacers. Instead, they rely on a meticulously planned grid that is laid out with chalk lines and adjusted to prevent (as much as possible) having to use small filler pieces where the tile meets the walls. 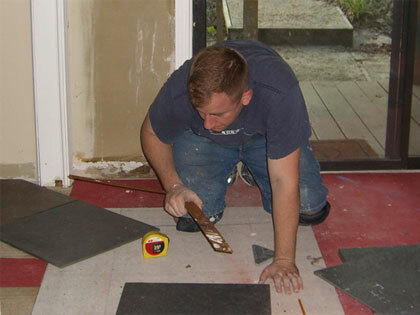 While we could have just picked a place and started laying tile, the grid method allowed us to make cuts in one location while someone else was actually laying the tile. For more pictures from the process, check out our photo gallery. With all these home improvement projects going on and the prep work leading up to the tile project, it’s hard to keep up with all the other things that are going on. Somehow though, in the last 3 weeks I posted an article to WPDFD, spoke to some prospective web designers at the Atlanta Art Institute, was interviewed for Smashing Magazine’s 50 Designers x 6 Questions and my book sold out again. Ames is busy as well, pulling together her research proposal for the next 3 years of the PhD program. Labor days, indeed. Whew! looks like a blast! ..I’m sure you’re relieved to have that behind you. Jason and Amy, what a Great looking floor ! I really don’t think there is anything the two of you can’t do, when you want it. It was awesome of Ed and Donna to come up and do all that work as well, they’re wonderful people.